Plant of the month. April 2014: Summer Wine Ninebark – Glacier View Landscape and Design, Inc.
April is near and this month’s plant of the month is a hardy flowering shrub that does well around Broomfield to add beautiful deep burgundy wine red foliage color to any landscape.”Summer Wine Ninebark” or Physocarpus Opulifolius. Summer Wine Ninebark is a cultivar of Ninebark Nana and Diabolo. They will flourish from about zones 3 thru 8, and grow 4’-6’ tall and wide. They have an open branching structure, with long drooping stems that continue to flourish with new growth from the center of the plant. They can be pruned to maintain a compact or hedge form just after spring bloom, but I find it best to let them have enough room to keep their natural shape. They can handle a prune to the ground to begin again in the spring if so desired. Spirea like flower clusters are born in late spring to early summer and will last for 6 weeks. 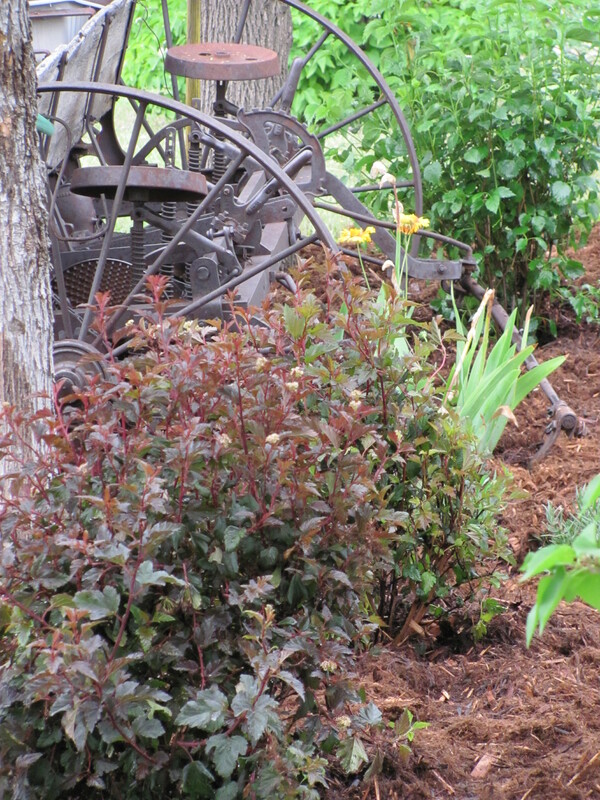 But it is the deep burgundy to almost black foliage that stands out in any garden landscape! Summer Wine is desirable here on the Colorado Front Range because of it’s tolerance to alkaline soilsand harsh growing conditions. It can handle the clay soils, though does better with good loamy soil amendments. It likes full sun, but can handle a partial shade environment. It is low moisture tolerant once established, but does better with regular watering. It is one of the first plants in a landscape of new plantings to show signs of underwatering and can lose leaves to avoid stress when newly planted if not watered regularly for the first month. A good soaking for the first week is recommended after planting in hot weather to avoid heat stresses. For smaller yards in Broomfield, Colorado, this is a definite “go to” shrub! Plant in groups of 3 or 5, or as a stand alone accent where a burst of color and interest is desired. Prune tips to encourage compact full structure after flowering in late spring or early summer. Some winter kill in Colorado is possible. Prune out as needed.